It is nice to have both hands free when using the Amateur Radio - especially when operating a Special Event station or contesting, because you can fill in the log, and fiddle with the radio controls while talking. And ... your thumb gets tired using a fist mic! With the popularity of gaming and Skype, some nice headphones with microphone booms are available quite cheaply. I bought one of these: "Gearhead" AU3700S Computer headsets for £10.91. This one has 3.5mm stereo jack plugs for the microphone and headphones. I noticed that quite a lot of the headsets now come with a USB plug, which presumably has a USB soundcard built in. Not much use if you want to connect to an old analogue wireless set! Make sure you get one with jacks. The headset is actually terminated in a "four ring" jack plug, suitable for Apple devices (apparently) but comes with a Y adaptor with a separate plug for headphones and microphone. To use the headset with a radio we need some kind of adaptor box. This will have socket(s) for the headset and leads to plug into the microphone and headphone sockets on the radio. 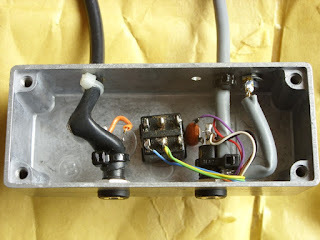 It will have a Transmit/Receive switch or PTT button, and with supply a bias Voltage to drive the electret condensor element in the microphone. So this is what I built. I decided to stick with the "Y" adaptor on the headset, because it means that the box becomes more versatile having separate sockets for mic and headphones. 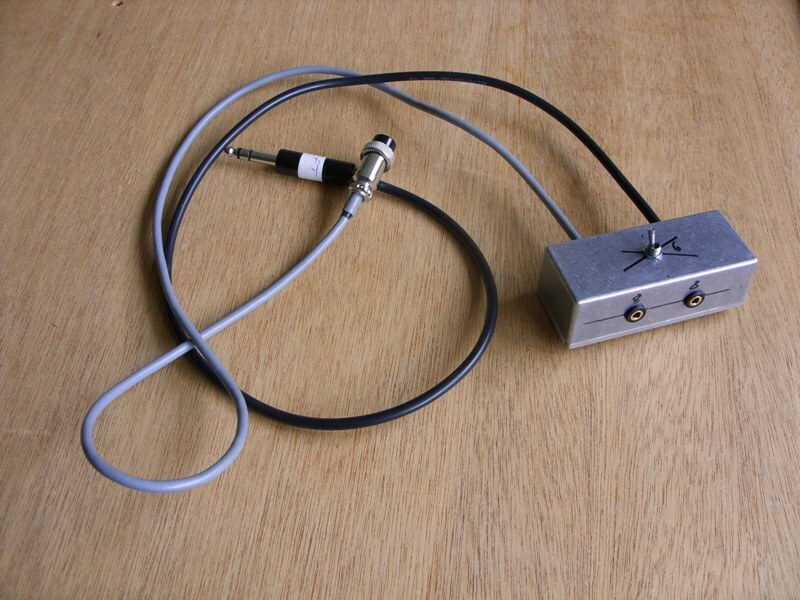 I wanted the box to be well screened because there maybe high RF fields around, so I used a diecast aluminium box, from Hammond Manufacturing (Pt. No. 27969PSLA) - it is one I picked up last year at a Radio Rally. I found some flexible 9-way screened cable - more conductors than needed but I doubled up the ground connections to try and keep the impedances low. But we have to be careful not to introduce ground loops. There is the cable screen, there is the microphone ground, there is the headphone ground and there is the PTT ground, and really they should all be kept separate. Trouble is a lot of jack sockets have a metal fixing nut that connects the barrel of the jack to the metal box that they are mounted on. Fortunately I found some inexpensive, 3.5mm Jack sockets on E-bay which have a single (8mm dia) hole fixing, but are completely insulated from the metal panel. 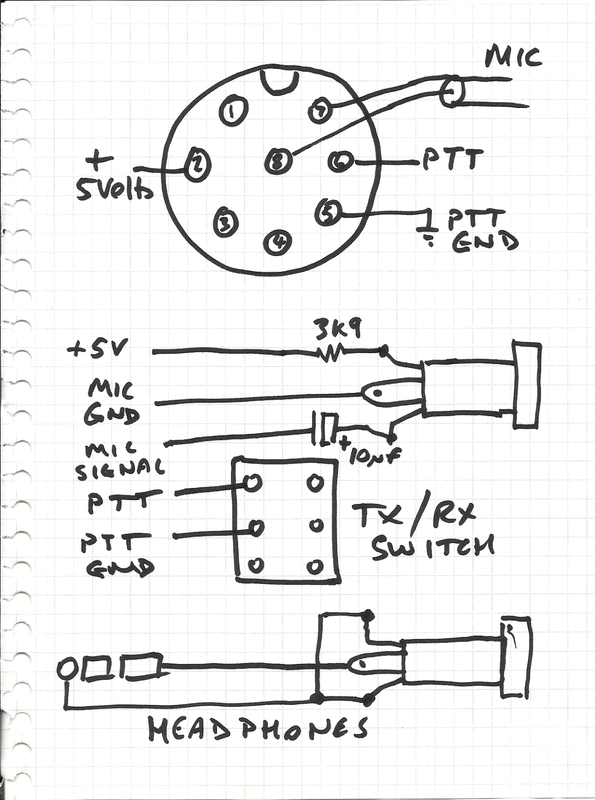 The FT847 manual has a useful diagram showing the microphone connections. 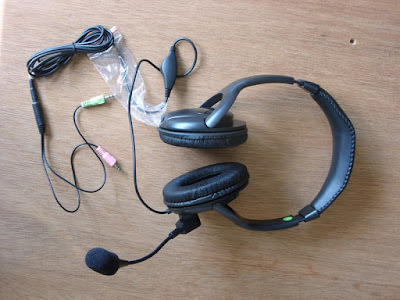 The headset connections are fairly standard - in fact there is an industry standard which specifies the microphone and speaker connections. 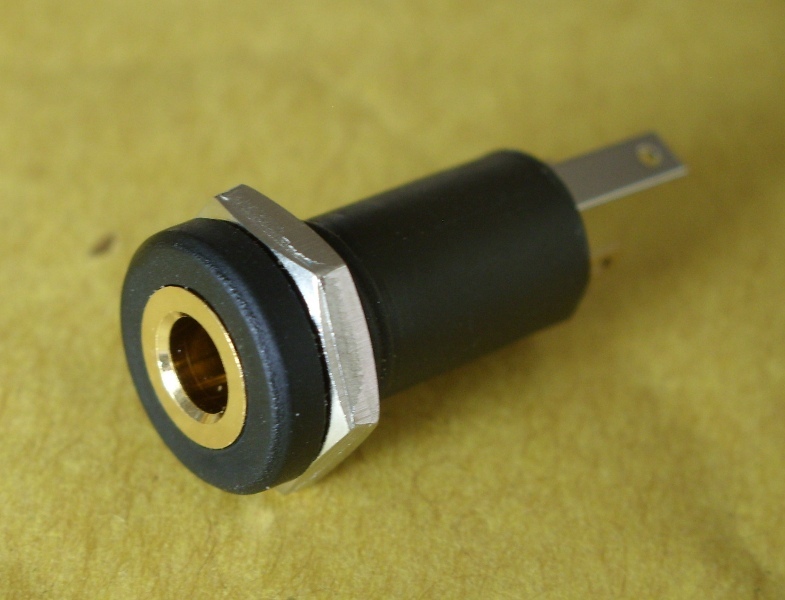 On the microphone the tip carries the signal and should be capacitively coupled, the ring carries the bias Voltage which must be less than 5.5Volts and sourced from an impedance greater than 2.2 kilohms. 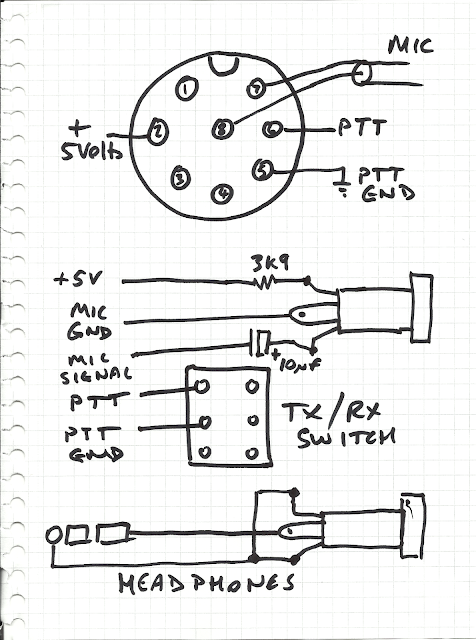 I used a 10uF solid aluminium electrolytic capacitor and a 3k9 resistor for coupling and bias resistor. Seems to work well. The mic connector is viewed looking at the front-panel of the radio. So it is viewed from the solder-terminal side of the (female) microphone plug. The "spare" pins on the mic connector are used for "up" and "down" buttons on the microphone - but I haven't used them here. The headphone circuit is kept completely separate - partly because the radio offers the facility to listen to your own SSB transmissions, so we don't want any audio getting back into the microphone socket. I used RG58 for the interconnecting cable, as we only need a mono signal for the 'phones. 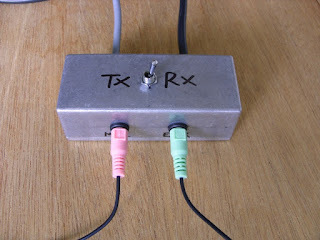 the TX/RX switch is just a bog-standard DPDT toggle switch. So here are a couple of pictures of the "innerds". I have tywrapped the incoming cables to the body of the jack socket. There may be more elegant ways of strain-relieving the cable but this seems to work ok. The big fat grey wire, is actually the braid from the multicore cable being soldered to a solder tag on the die-cast box. Might have been better if this was a shorter connection from an RF screening point of view, but hopefully it will keep HF frequencies out of the box. On air reports have, so far, been favourable. One thing to note is that the output of the electret condensor mic is much higher than the standard fist mic supplied with the radio. I used a deviation meter to check the FM modulation level, and found that I had to reduce the FM microphone gain from 32 to 12 in the menu system. Menu 25 [FM-PSET]. I also went through the procedure for setting the SSB microphone gain - setting the meter on the rig to measure ALC using Menu 24 [TX-MTR]. 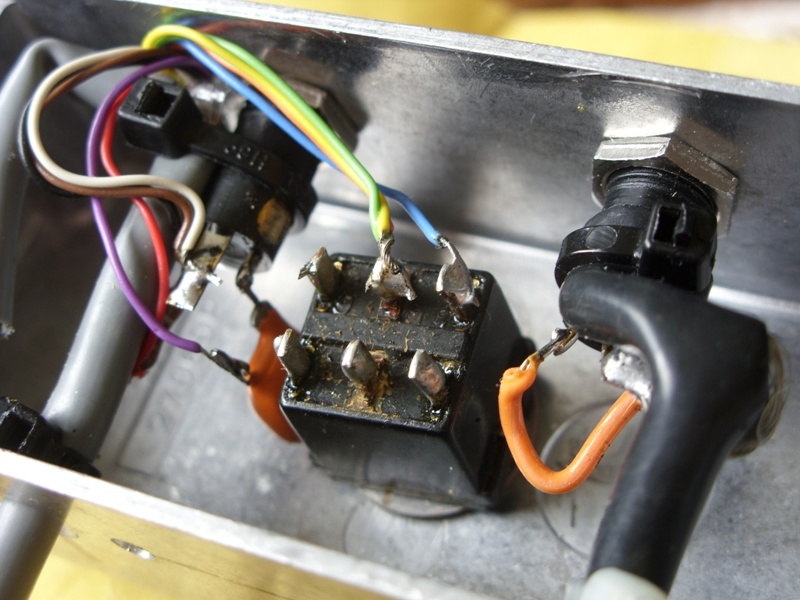 Strangely the SSB mic gain is set close to where it usually is. The "Moni" feature on the radio is great for listening to your own input, you can set the Monitor Volume using menu 20 [MONI-VOL] - but unfortunately you can't monitor when using the speech processor as it uses the same circuitry! So there you have it, a Bank-holiday-Monday headset to FT847 adaptor box. But found the thread on the locking ring was poorly made, and won't screw up on the socket - so I will have to change it ... a pigging nuisance!